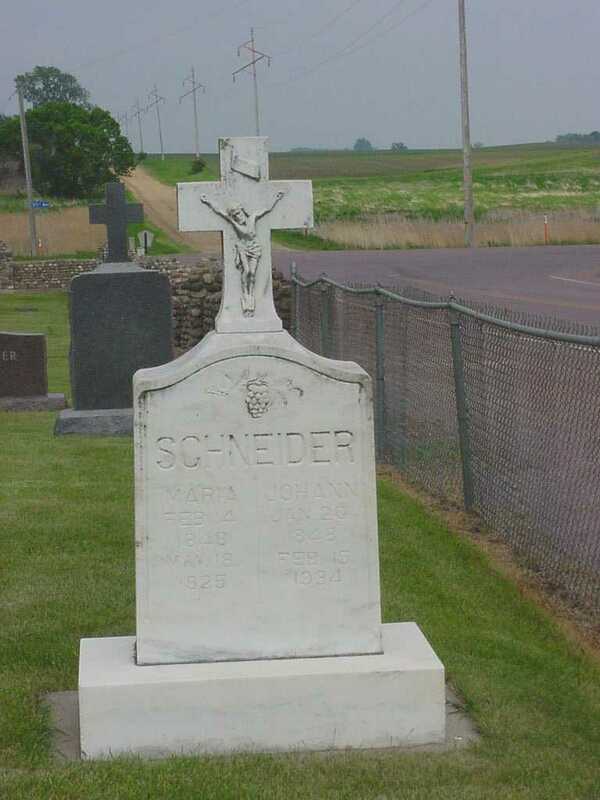 John 1822-1897 and Anna (Scheuble) 1835-1889 had 10 children, 9 of whom survived: Lena (Jenneke), Emma (Bergman), Bertha (Miller), George, Emil, Ida (Coyour), Fredericka (Hanson), Otto and Theodore. 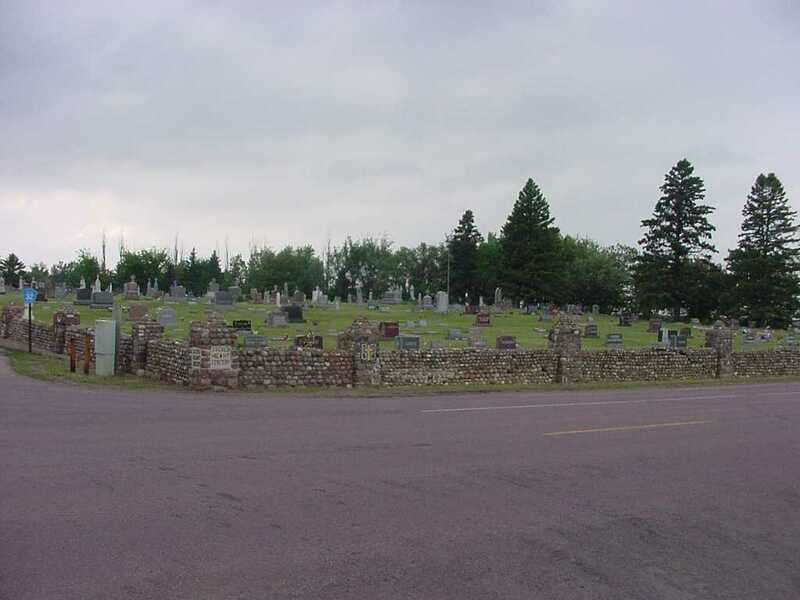 George (and his wife) are buried in this cemetery (see this page), and Bertha (and her husband) and Theodore are buried in Heron Lake City Cemetery, next to each other (see Heron Lake City Cemetery, P.1). John built the first hotel in Waconia, MN, and was in the Civil War, MN 5th Regiment Infantry, in 1862. His biography can be found here. 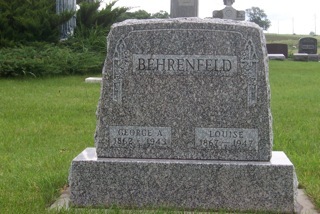 George 1862-1943 (son of John and Anna Behrenfeld) and Louise (Pawlitshek) 1867-1947 had 6 children: Mabel (Smith), Beatrice (Franks), Eva Marie (Lindquist) Cyril (or John Cyril), Raymond, and Mary Ann (Amland). 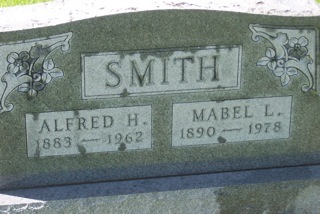 Daughter Mabel is buried in this cemetery with her husband, Alfred Smith, and son, Leonard Smith (see this page). 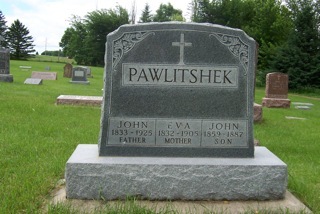 Louise was the daughter of John and Eva (Bartosh) Pawlitshek (see this page). 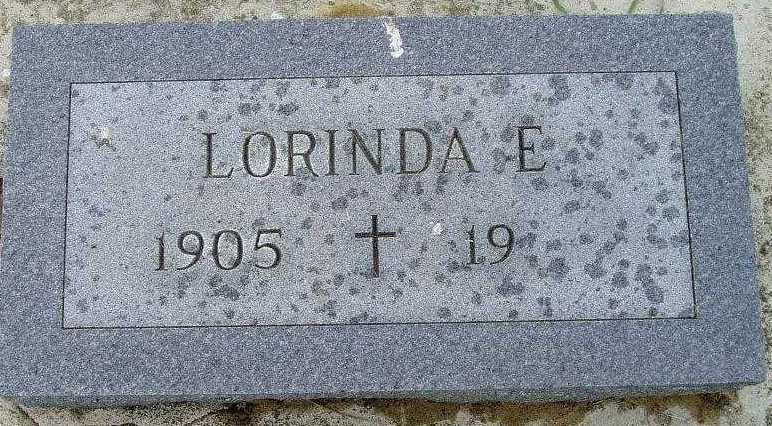 Great-Great Grandmother and Great-Grandmother of the photographer are located here. 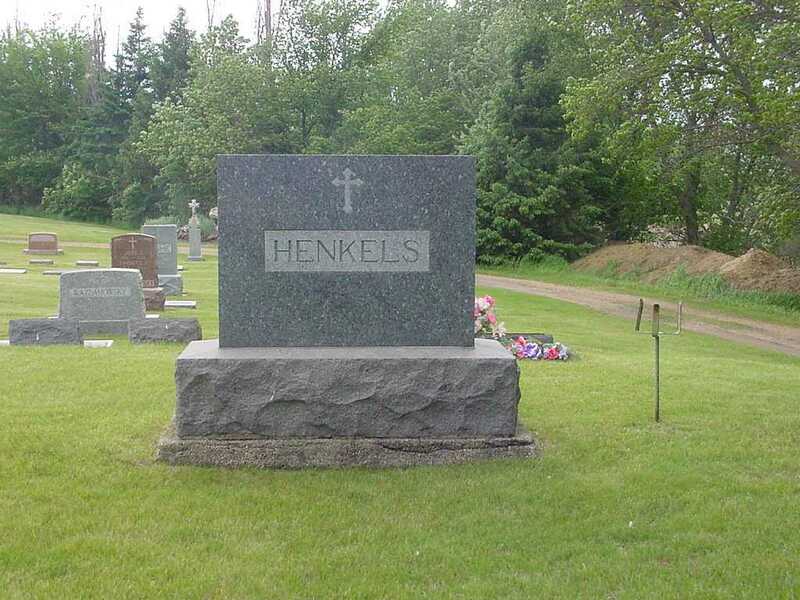 Two Henkels children died in July of 1885 of diptheria...some of the oldest burials in the cemetery. The tombstone marks the family plot for the John Mathias family. 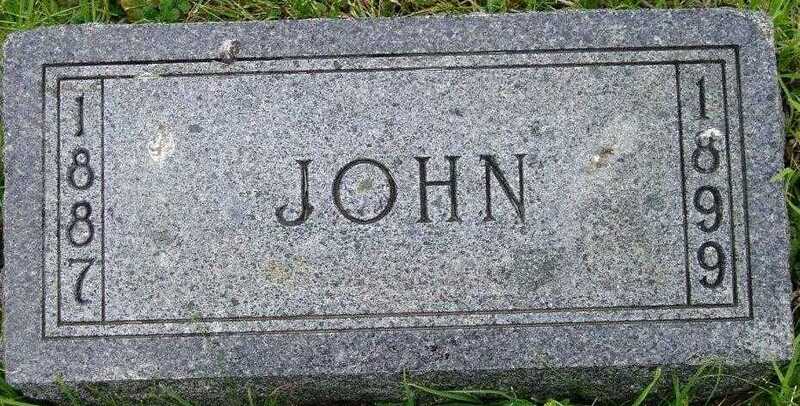 John was a very successful immigrant from Luxembourg who homesteaded in Southbrook Township (neighboring Cottonwood Co). 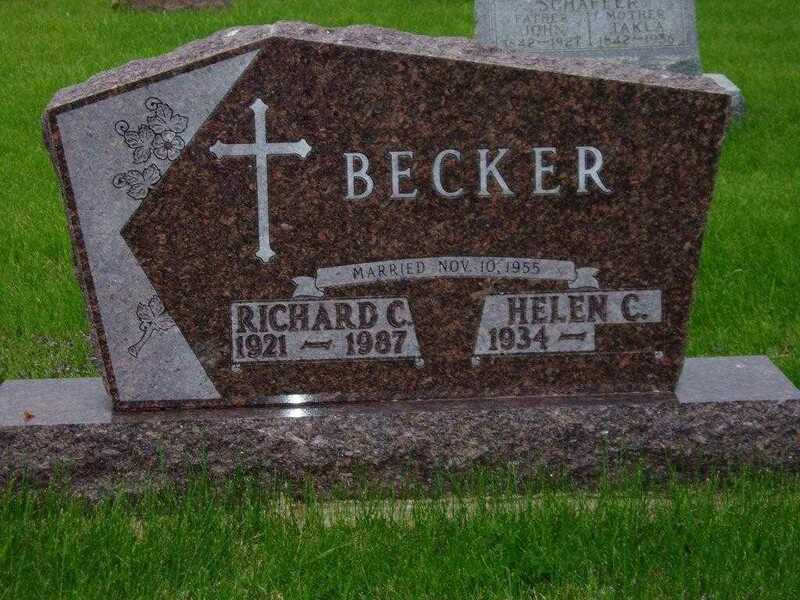 He married my great grandmothers sister Elizabeth Jentgen. 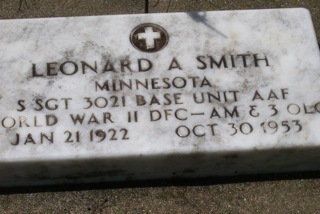 The tombstone was actually placed and is inscribed for his son Joseph Mathias. 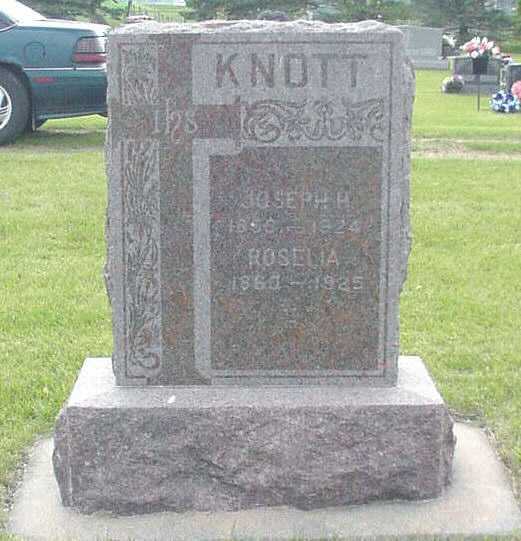 Joseph was one of 7 victims of the 1903 tornado which hit primarily Lacrosse Township of Jackson Co and Springfield and Great Bend townships of Cottonwood Co. 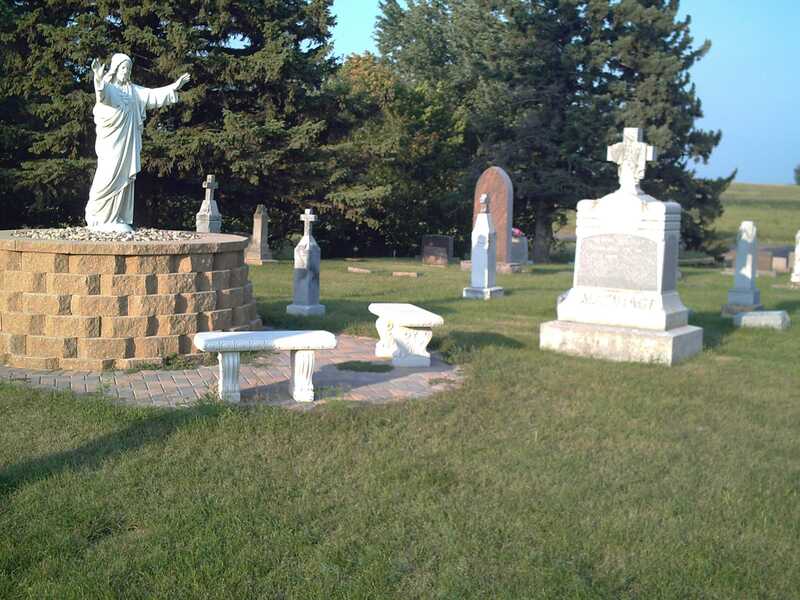 It wasn't a good day for Catholics...4 are buried at Sacred Heart and 3 are buried at St. Francis Xavier in Windom (Cottonwood Co). 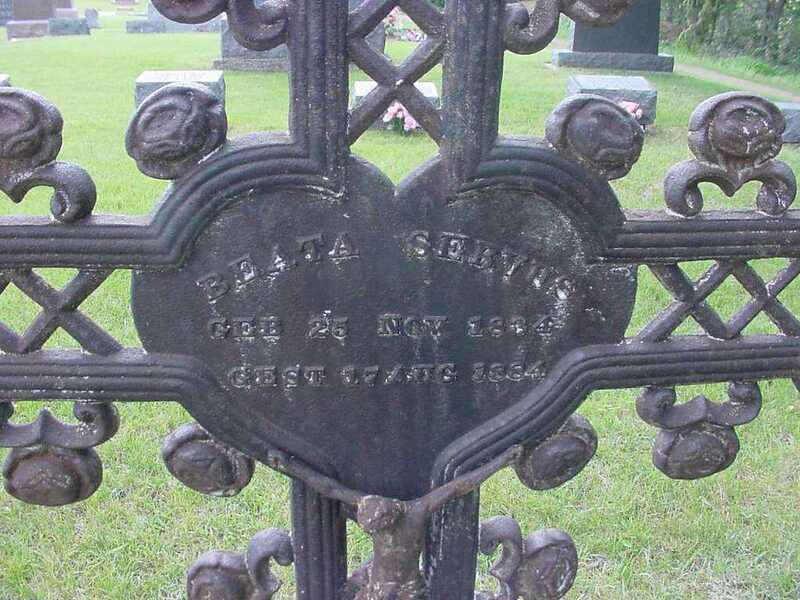 John 1833-1925 and Eva (Bartosh) 1832-1905 had 4 children: John, Jr., Amelia, Louise (Behrenfeld), and Pauline (Anderson). Son John Jr. 1859-1887 and daughter Louise Behrenfeld are buried in this cemetery, John with his parents and Louise with her husband, George Behrenfeld (see this page). SCHNEIDER, John , homesteader from Southbrook Tnsp, Cottonwood Co.
Servus, Beata, one of the oldest burials in the cemetery. 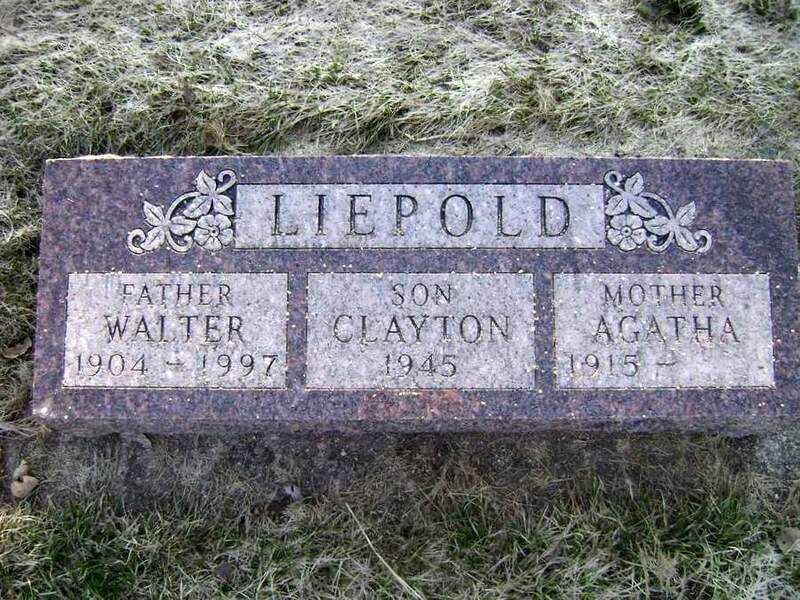 Alfred 1883-1962 and Mabel 1890-1978 (Behrenfeld) had 5 children: George, Leonard, Maxine (Winter), Virginia (Hart), and Mary Jean (Trampaklos). 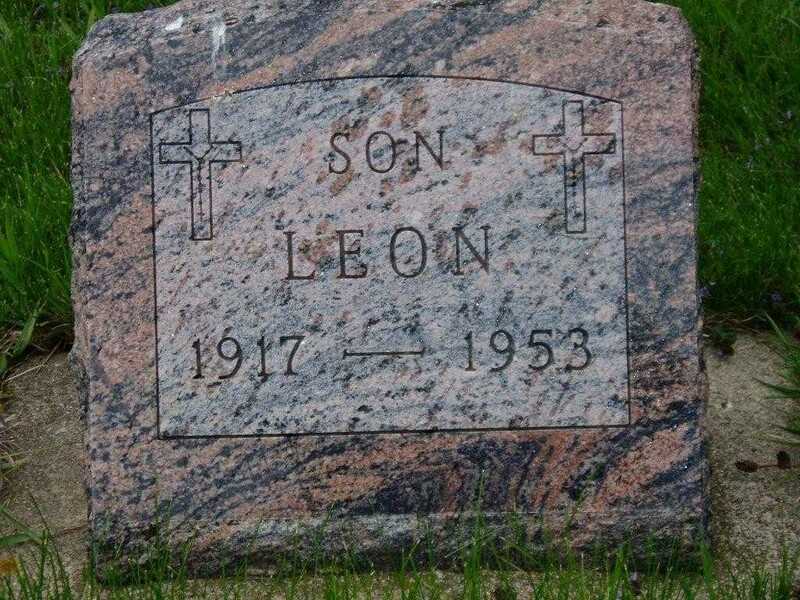 Son Leonard 1922-1953 is buried in this cemetery. Mabel was the daughter of George and Louise Behrenfeld (see this page) and grand-daughter of John and Anna Behrenfeld (see this page).